I’ve been working on embroidery for at least a year. Here are some of my recent projects. 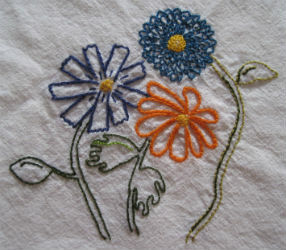 These flowers are adapted from a design by Clare Youngs in the book Scandinavian Needlecraft. It was noted how similar this design is to some Ojibwa designs. I was pleased with the results. 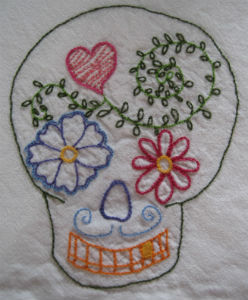 The first attempt was freehand on the towel, which didn’t please me very much. Part of the problem was that the hoop was quite a bit smaller than the design, so I couldn’t see it all at once while I was working on it. 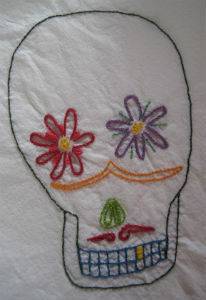 Perhaps I will “fix” it someday by adding some pretty brains, but now I am interested in other projects. Here’s another freehand, doodle design. I would like it better if the flowers had been based on actual plants. 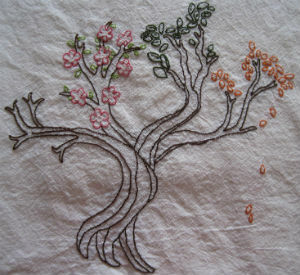 The tree design was adapted from one by Aimée Ray in Doodle Stitching: The Motif Collection. There is a design to inspire almost anyone in this fun book. An upcycling project that I had been considering was to make a rug from old t-shirts. The process of cutting the strips held me back, even though I use a rotary cutter. Enter one of my favorite thrift stores, The Clothes Closet of Hettinger, North Dakota. I purchased two latch hook rug canvases, fabric strips, and a latch hook tool for one dollar! One rug was started, with a fabric strip for each “hole” in the canvas. It was bunched-up, but I thought that might be due the small size of the started rug. I added more strips. It didn’t get better. I took apart the rug and washed the fabric strips in a lingerie bag. The washing made the fabric curl up and easier to latch to the canvas. The Crafty Woman blog has detailed instructions on how to make a jersey rug and spacing the strips made the rug much easier to hook and it laid flat right away. 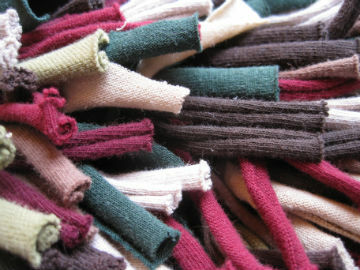 The fabric strips that I used are 3/4″ wide by 6″ long. A project that I want to start is re-covering the cracked vinyl covers on four kitchen chair seats. Jenny suggested that I should cover the fabric with a clear vinyl so that they are easy to clean. What a great idea! If you have any suggestions before I start, please let me know. 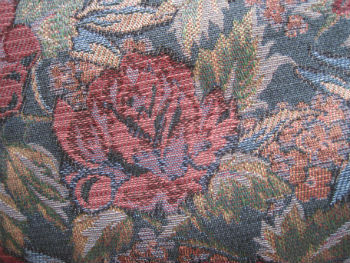 Here’s the fabric that I picked up for the chairs at another favorite thrift store, Waupaca Thrift Store. While I was writing this post, I was listening to an audiobook until it got too difficult to write and focus on the story. Turns out that I can fold the laundry, but not compose, while listening. The book is The Case of the Deadly Butter Chicken by Tarquin Hall, featuring the fictional private investegator Vish Puri. Besides the great title, the book provides a great description of contemporary India, detailed characters, and a good mystery without being too cozy or too violent. I highly recommend it to mystery readers. If you are a Wisconsin resident with a library card in good standing, you may download the audiobook through Wisconsin’s Digital Library. There is no additional cost for Wisconsin residents to check out this book, since it has already been paid for through taxes. 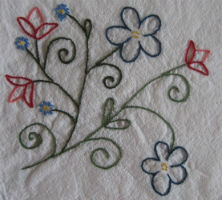 This entry was posted in Book review, embroidery, sewing and tagged audiobooks, book reviews, books, embroidery, sewing, upcycling.